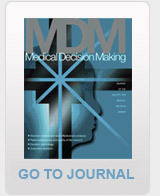 SMDM is pleased to announce the launch of a new, open access journal, titled Medical Decision Making Policy & Practice (MDM P&P). Click here to view the first collection of articles. The Second Panel on Cost-Effectiveness in Health and Medicine is posting for public comment selected draft chapters for its updated book, Cost-Effectiveness in Health and Medicine. Our health is inextricably linked to our mission readiness on the battlefield, our productivity on the job, our educational attainment in the classroom, and our competitiveness around the world. Federal agencies and programs have a unique role in enhancing Americans’ health and well-being. Investment in these areas has and will continue to show returns on taxpayer dollars.